150 farriers, apprentices and friends gathered at The Forge at Stoneleigh for a clinic hosted by Billy Crothers and his wife Lucy Diamond, Managing Director of Handmade Shoes (UK) Ltd. Presented as a chance to ‘give something back’ Billy Crothers, himself five times winner of the World Championship Blacksmiths Competition, introduced our guest speakers for the day; Rob Renirie and Mitch Taylor. 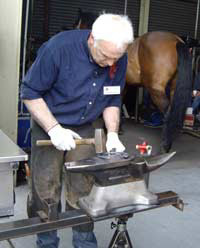 Rob Renirie, farrier to the Dutch Olympic Team, is a leading authority throughout Europe on shoeing competition horses, specialising in dressage. The morning session with Rob consisted of a presentation of two parts, a lecture based on the principles of good shoeing and a live demonstration on shoeing the dressage horse. 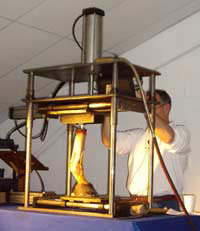 Good shoeing, by Rob’s definition, is based on the preliminary examination, the exact trimming of the foot, the right choice of materials, the support and balance of the foot and the frequency of shoeing. A farrier does not have x-ray eyes and therefore honesty is essential and stressed that there was no shame in saying that you didn’t know how to do something. 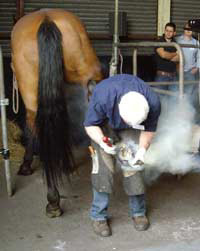 The aim of the farrier is not to always correct feet but to protect feet. 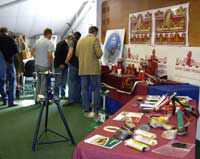 Rob acknowledged the array of new products and modern materials available on the market today and whilst each has its own place suggested that they should only be used if they are needed. Craftsmanship comes above all and must not be lost. From the outset the presentation was executed in an uncomplicated inspiring manner, a true reflection of his shoeing style. Rob’s understanding of not just the horse and shoeing the horse but the relationship between horse, owner/rider, veterinarian, trainer and farrier was both refreshingly honest and humbling. Before us was a Master Farrier successfully employed at the highest level within his craft and yet his clear, affable approach to his work was second to none. 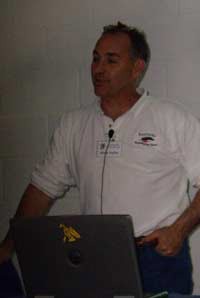 Mitch Taylor, Director of the Kentucky Horseshoeing School, is a leading authority on biomechanics, conformation and anatomy. Work with Dr. Jim Rooney played a part in Mitch’s inspiration to learn more about equine anatomy and locomotion - indeed $800 million a year is spent on equine lameness - a figure that cannot be dismissed. Using slow motion video, we were bestowed with an analysis of horses moving at different speeds on different surfaces and in different environments. Using Ontrack software, the video footage could be analysed to examine movement and angles in joints, tendons and ligaments – an insight into the true, quite remarkable, natural movement and substantial ability of the equine limb to uphold the pressures placed upon it. A live dissection of an equine fore-limb followed the video analysis further reiterating the complexities of the structure we can so often take for granted. The energy with which horses use to move and fulfil the requirements we place upon them comes with a price in nature and whilst there are many hoofed animals very few have the athletic potential of the horse. Mitch demonstrated an awareness and appreciation of the equine limb and his quest for further knowledge was somewhat infectious. Yet again, the audience were treated to an excellent consultation that was not only open in style but delivered with an engaging injection of humour! 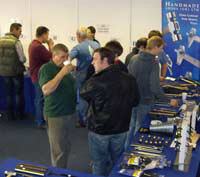 The day was complete with a comprehensive commercial exhibition, a chance to put names to faces of all the team at Handmade Shoes (UK) Ltd and time to confer and exchange views with colleagues within the industry. The clinic provided an inspiring and informative day confirming the increasing in-depth knowledge at our finger tips amongst farriers across the globe.